Details: Bring your group to the warehouse and help stuff about 150 backpacks with non-perishable food items. All materials provided, you simply need to show up and be willing to work and stuff backpacks. 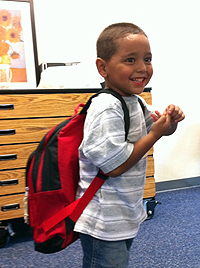 The backpacks are given out on Fridays to students identified as “homeless” by the school system. The students receive free lunches during the school week, but your hands-on work will ensure that they and their families have a well-nourished weekend. Optional but Appreciated: Your hard work is most appreciated, but canned foods are always appreciated. If your group would like to bring some of the most needed items, they are: canned beans, mac-n-cheese cups, 12 oz jars of peanut butter, canned tuna and Progresso soups. Above and beyond option: Monetary donations of any amount can be put toward buying a pallet of food, whether it’s macaroni and cheese, peanut butter, or another food that goes into children’s backpacks every week. The average cost of a pallet is $300 dollars. If this interests you, please click on this link.